Mary Ellen Seidman is a professional calligrapher specializing in weddings, logos, and custom-designed maps. She started practicing calligraphy many years ago when she was a stay-at-home mom to three young children. 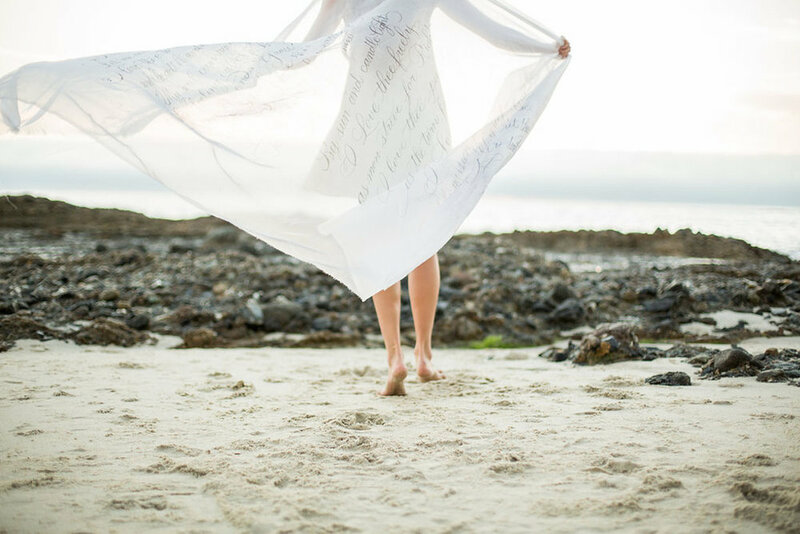 In 2010, Calligraphy by Mary Ellen became a full-time business offering calligraphy, hand lettering, and digital design. Today, Mary Ellen works with clients and offers private lessons in the Philadelphia area. She is also an active member of the Philadelphia Calligrapher’s Society and IAMPETH. I interviewed Mary Ellen via email to learn her advice for budding freelance calligraphers and some of her favorite tools. I am located in Marlton, New Jersey, about 15 miles outside of Philadelphia, Pennsylvania (USA). My first introduction to calligraphy was in a college typography class. It was in that class when I learned the importance of type and lettering in design. When planning my own wedding, I knew that I wanted to design my invitation, and I addressed them in a very beginner calligraphy style. As newlyweds, my husband and I owned a café in Old City, Philadelphia. It was there that I got to practice more by hand-lettering our seasonal menu. My calligraphy was very raw but our customers loved the look of it. It wasn’t until after the birth of my third child, Claire, that I took my first class in calligraphy. I took every class offered and from there my love of pen and ink was born. You offer a variety of script styles, ranging from very flourished and formal to loose and lowercase. What’s your favorite and why? My favorite hand is flourished Copperplate – it’s what I feel comes most naturally to me. Recently I’ve started offering a modern style script which took some time to develop. I have fallen in love with that too, so I guess I have a hard time picking a favorite! What is your favorite type of project to do for a client? What about your favorite project to do for yourself? My favorite type of client calligraphy project is working with a bride and groom from their save the date to their invitation through to wedding day place cards, table numbers, and reception signs. Recently I have been studying watercolor painting and would like to combine my two loves – calligraphy and painting – into my work. The most important lesson I have learned about establishing a freelance business is to believe in yourself and your craft. It took me a long time to be confident in offering my calligraphy to clients. Set goals and always challenge yourself. Know your value and don’t compromise to please someone else. My advice for beginning lettering artists would be to study, practice, and study and practice some more! Never stop learning. The calligraphy community is very giving and nurturing, take the time to get to know your fellow calligraphers. They have a wealth of knowledge and most are happy to share. Also, running your own business requires you to have knowledge in accounting, publicity, trends, pricing, social media, technology and mastering your craft. What are the top 5 lettering tools or resources you couldn’t live without? Dr. Martin’s inks and supplies from Paper & Ink Arts. Another favorite tool is the often overlooked office chair! I experienced bad back pain while working from a very bad inexpensive chair. I couldn’t live without Photoshop for editing my calligraphy and also my Wacom Cintiq Graphic Monitor. It has enabled me to edit and layout my calligraphy so much more efficiently. My nerdy interest is collecting vintage stamps. 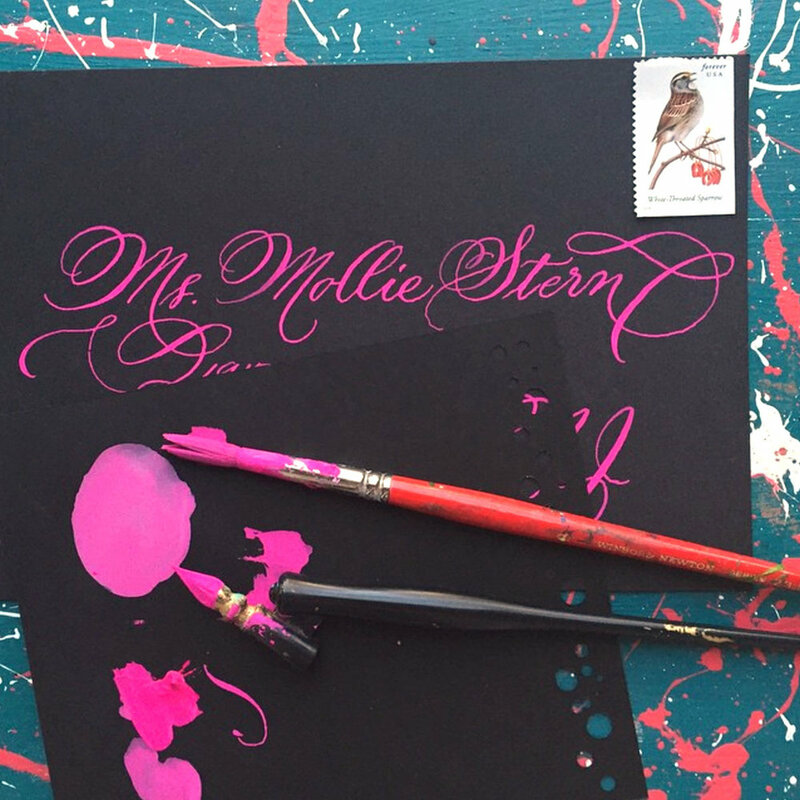 I use them to style my calligraphy snail mail and I’m always on the hunt for more treasures! My business is always evolving and growing, I have recently started giving private lessons, which requires a whole new skill set. It’s been challenging and fun and made me brush up on the basics of copperplate calligraphy. I think keeping current with new trends and styles is important in today’s marketplace.